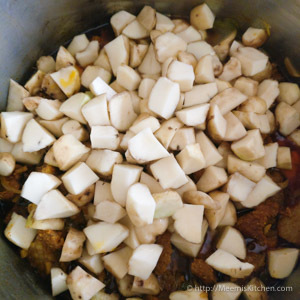 Pork koorka ularthiyathu is a traditional Pork dish from the Thrissur region in Kerala, a classic preparation with Pork and Koorka (Chinese Potato). Koorka and Pork is a phenomenal combination with incredible flavours. You will love the earthy flavours of koorka, combined with succulent pieces of pork, the heat from the pepper, the sourness from vinegar, and the aroma from spices. It is a very popular dish in Angamaly – Thrissur region, and every celebration or feast is incomplete without this Pork koorka ularthiyathu. Although I am not an ardent Pork meat lover now, I used to love Pork during my childhood: my dad’s side of the family loved Pork/ “Panniyirachi” dishes – Pork curry, Pork Fry all were favourite dishes. As my mom wouldn’t touch Pork, Elsyaunty and Ammaunty used to prepare Pork dishes during our get togethers. My dad was an excellent cook too, and his Pork pepper fry also had great demand. After I posted that recipe for Pork Pepper fry, I got several requests asking me to post this Pork Koorka recipe. Recently one dear friend got me some Koorka from Kerala and I thought of this recipe. Koorka is a rich source of calcium, iron, many other minerals and vitamins. If you love koorka, check my Koorka mezhukkupuratti, which is a great way to prepare this tuber vegetable. Meat and vegetable combinations are always hearty and healthy. Please do check my classic combinations like Beef and Kaya ularthiyath, Beef and beetroot combo, Nadan chicken curry with potatoes, Duck Pepper fry, Egg curry with Potatoes, Beef and Mushroom, Cabbage Irachi thoran, Meatball curry etc. As I have told you, I am not a big pork fan. I am only fond of certain pork dishes like Chilly Pork, my cousin Linu’s Pork ribs, and Pork pepper fry. Having said that, I strongly recommend this Pork koorka recipe, it is a must try recipe, if you love koorka. This Pork Koorka ularthu should be set aside for few hours, so that every mouthful, fills you with marvelous flavours. You can increase the measure of black pepper, if you like that peppery taste. The ratio of Pork and Koorka is up to you. I have opted for equal measure, you can reduce or increase koorka in your Pork curry. I pressure cooked the Pork till one whistle, If you can slow roast the pork, it will give better flavours, as per darling Elsyaunty (She is from Angamaly, so knows better, I did the easy way). My kids don’t share my enthusiasm for koorka, but i don’t mind a bit (i get to relish the leftover koorkas). Well then, here is the much-awaited recipe for Nadan Pork Koorka Ularthiyathu. Enjoy!! Clean and dry the Pork pieces (with enough fat). 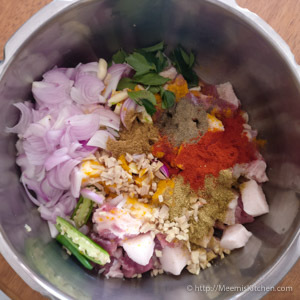 In a pressure cooker, marinate the pork with chopped Ginger and garlic, slit green chilli, sliced onions (one and a half), Coriander Powder, Red Chilli Powder, Turmeric Powder, Pepper powder, Garam Masala Powder, curry leaves, salt, coconut oil and vinegar. Cover well and keep aside for half hour. After half hour, pressure cook till one whistle, or cover well and slow cook till almost done, stirring in between. Meanwhile, clean/ peel the Koorka, cut into bite size pieces and put it in water. Once the Pork is almost cooked, open the cover and add drained koorka pieces. Combine well, cover and cook on slow fire (stirring in between) till Pork and koorka are cooked well. Take some clear Pork fat (do not add extra oil) from the cooker and heat in a pan. 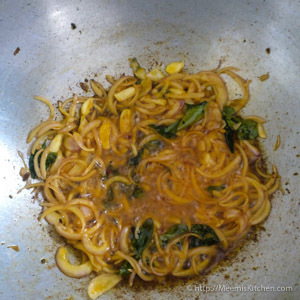 Add sliced garlic and curry leaves and fry till light brown, add sliced onion (half) and fry. 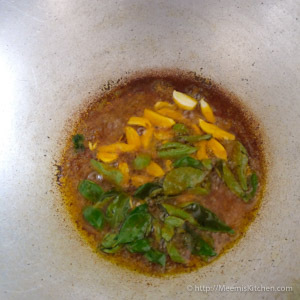 Next, add remaining Pepper Powder and Turmeric powder and a pinch of garam Masala and sauté well. Then add the Pork koorka with all gravy into this and combine well till the gravy coat pork and koorka. Cover and keep aside for some time to enhance the flavours. Warm slightly before serving. Serve with Kerala rice, Kumbalanga Moru curry, Padavalanga Carrot thoran and Pavakka fry. This is my favourite combination. Pork with enough fat is best for this recipe. Meat alone will make the dish dry and tasteless. After cleaning koorka immerse it in water to avoid darkening of skin. Coconut oil should be used for the best flavours. Coconut oil gives the traditional authentic taste and is good for health. While marinating, make sure the Pork is well covered. Do not add water while cooking Pork. If you are slow roasting, add little only if becomes dry. Pressure cook Pork for just one whistle and wait till the entire pressure is released. If you are slow cooking, cook till almost done. Add koorka to the Pork gravy and cook till done. If you want to speed up the process, pressure cook till one whistle. To intensify the flavours, keep the Pork covered and rest for some time. Just warm slightly before serving. 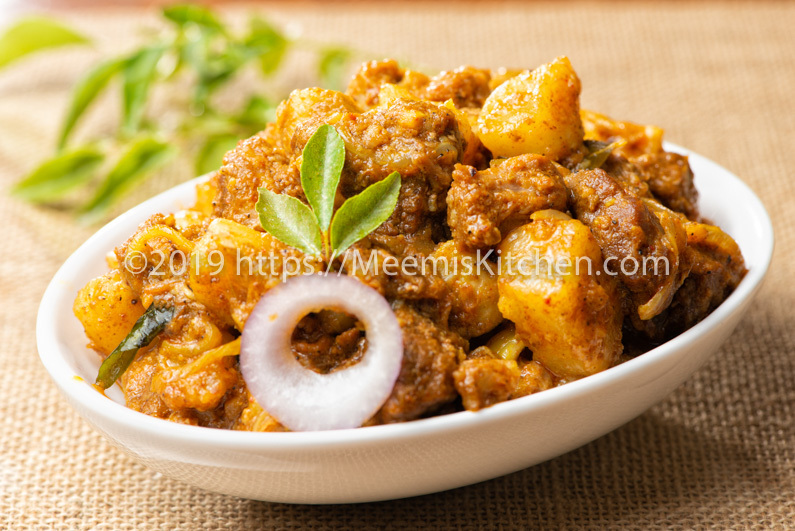 If you like this Pork Koorka Ularthiyath recipe, please share with your friends using the share buttons on the side or put in your comments. I will be happy to see your comments. God Bless!! Thank you Mikku. Do try and let me know how it turned out for you. Keep visiting!